Thank you to everyone who helped make the 2019 Colorado Fiddle Championships one of the finest fiddle contests in the nation! Contest results are posted HERE! 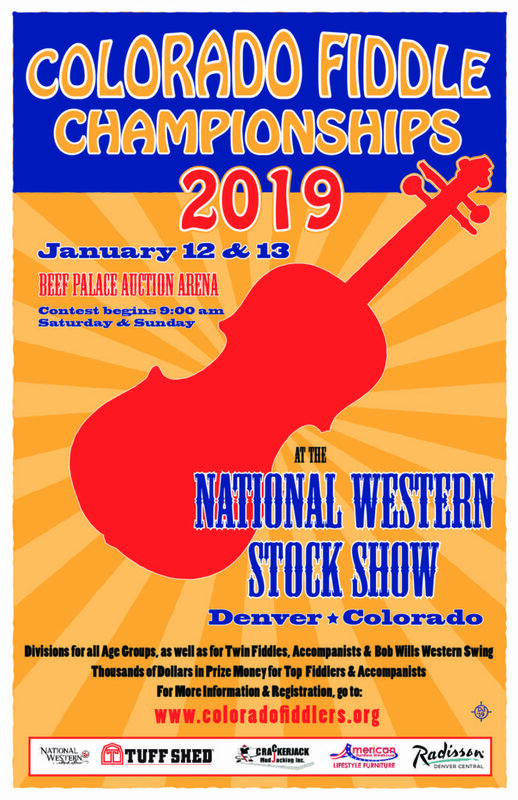 The 17th annual Colorado Fiddle Championships (CFC) at the National Western Stock Show was held on January 12th and 13th, 2019. The contest is annually held the first weekend in the Beef Palace Auction Arena at the National Western Complex. The Colorado Fiddle Championships draws nationally recognized fiddlers, including previous Grand Champions of the National Oldtime Fiddlers contest, Bob Wills Fiddle Festival & Contest, Texas State Championships/Fiddlers Frolics and Grand Masters Champions. COTFA is so proud to have Junior Marriott, Roberta Rast and Wes Westmoreland judge this year’s contest! Our 2019 staff guitar players are Anthony Mature and Hyatt Hopkins. For the third year, we are offering a Bob Wills Swing Fiddle division! This exciting division has been officially sanctioned by the Bob Wills Heritage Foundation Inc., which seeks to preserve and promote Bob Will’s legacy through publications, recordings, educational outreach, events – all avenues to share the music and story of this American innovator and artist. Click here for the Bob Wills rules. There will be a judged guitar accompanist division. We are proud and honored to have Jake Jabs of American Furniture Warehouse sponsor this division.